While ideas for Gibbers as a comic book go back well into my middle school years, the idea for a movie (whose script evolved into at least one scene in JKD1) or even being a filmmaker honestly did not even cross my mind until I met a kid by the name of Charles “Chuck” Geiser. I said during the Q&A for JKD1 that as a child I had wished to become a singer, and then puberty hit and so I instead pursued film. That’s not an inaccurate statement but not the entire truth. I met Chuck, who was two classes ahead of me in school, through mutual friends and I wish I could say we quickly became close friends but it was more that he did his thing and I followed like an annoying little puppy dog. Chuck had produced a short film for a social studies class project. A (sort-of) political thriller, Patriot Red told the story of how the United States was taken over by a communist government which was later overthrown by a group of freedom fighters. If it sounds a lot like Red Dawn, it kind of was, except with a cast of three, zero budget, class in-jokes, and a whole lot of early-2000’s-epic orchestral trailer music. had Chuck burn me a DVD of it (as well as the film by a friend that inspired him, New Projectile 187 – and the mash-up of the two that he created) and I watched it over and over, not so much that the story or movie itself intrigued me, but the idea that someone my age could feasibly create a cohesive short film with just their friends and a camera. No matter it was for class, or that it was incredibly silly. This was a whole new creative world opening up to me. And then myself and a mutual friend and classmate, Roman, asked Chuck to help us with our own class project. Despite my awkwardness on screen, True Love Sunglasses is what really got me hooked on filmmaking. I vividly remember sitting at the computer desk next to Chuck, enthralled as he pieced each clip together in Windows Movie Maker. The rest of the cast – Roman, Brittny, Cody – had all left, but Chuck & myself finished the project together, even adding goofy credits. This was where I fell in love with the post production process, deciding where to cut, which take to use, what music to use, and so on. 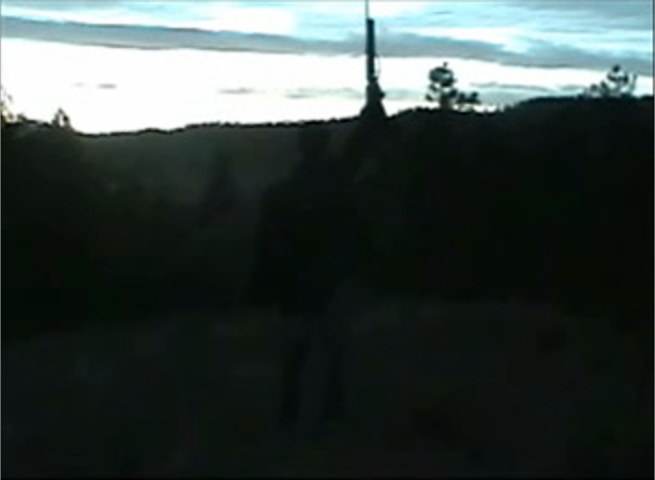 The chronology in my head vs reality is a little hard to pin down but with the help of some timestamps on old video renders saved by Matt Luebeck and personal notes on the margins of notebooks from the time period, I can safely say that True Love Sunglasses was filmed in early autumn 2004 and I was given a copy of Patriot Red at around that time. By late autumn/early winter 2004, I had scribbled notes about potential projects like “In Search of Jamie Klutz’s Diary” and “Where the F**k is Bermuda Anbesol.” In early 2005, I saw National Treasure at the local theater (a second-run theater) with my friend Jim (of A Day in Hot Springs fame), went straight to Jim’s house after the screening and stayed up all night writing the first draft to the Gibbers movie, and a couple months later, on Friday, May 14, 2005, I know for a fact that I edited my own first video project for a class. Chuck had also been creating comic strips starring cartoon-ized versions of his real life friends (“South Springs”) and frequently throughout his senior year and shortly thereafter kept talking about filming a feature film adaptation of the comic, and I was totally game, although it never came to fruition. Having ingrained myself into a social circle a couple years beyond myself, I ended up both as a character in the comic itself and later began aping the comic with my own iteration starring the characters of “The Week in Hot Springs” with equally lofty ambitions to complete the seven-day story of Jesse Gump, when it became obvious that “WIHS” was proving a difficult project to finish. 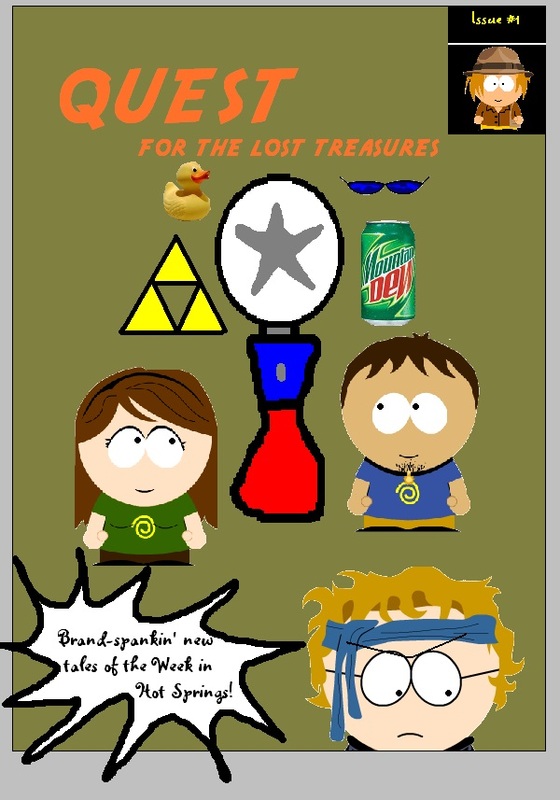 The cover to the comic version of Quest for the Lost Treasures. It’s telling that I have so much of the work Chuck did backed up still, including a couple MSN messenger chat logs in which Chuck described to me the outline of his big-scale South Springs story, “Global Denomination,” would be. In spite of me not actually having thought of, read or watched much of any of this again until this past weekend, it was significant material that meant something to me not just for its place in my personal friendships but also in terms of creative growth. In 2009, after Shards of the Transient Diamond had been taken off the slate but before we started production on the Adventures in Hot Springs webseries, I took it upon myself to remake the then-5-year-old True Love Sunglasses with a different cast. When I last saw Chuck, he and I spent a chunk of time together reminiscing and catching up. I filled him in on the story of JKD1 and by that time, we had already started production on JKD2. His reaction to the stories were that they were “certainly unique.” Ironically, neither would have been possible if he hadn’t taken it upon himself to help a friend with a class project and let the awkward sophomore sit and watch him edit, make suggestions and crack jokes. So here’s a very special pre-premiere thank you, Chuck for inspiring me to keep creating. 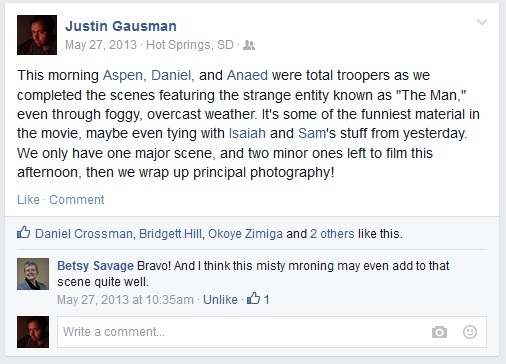 I don’t know what was up with the weather, but May 27 started out cold too, with a low-hanging cloud of fog over the whole town and a layer of dew on the grass. And it made for an amazing backdrop to the scene with The Man. Really, I’ve just gotta let the videos speak for themselves. The direction I gave was, in my opinion, minimal. Daniel took the character of the Man and ran with him, improvising huge chunks of dialogue. I couldn’t have asked for a better morning to perk me up from having missed my three-day goal. In fact, the only real problem was that midway through the scene, we realized that Jamie shouldn’t have her satchel. It had been stolen in the scene immediately before. So I came up with an on-the-spot in-universe explanation: when in the 6th dimension, you appear as you view yourself. To the Man, even having come from the middle ages, he’s a laid back beach bum at heart. To Jamie, her satchel is part of who she is at this point in her life. It signifies her adventurous nature – and probably some secrets. Or something like that. Instead of ignoring it, we addressed it in the opening shot straight on with an improvised line, and for the most part, later on, audiences never even cared or noticed. With the Man’s sole scene complete, Daniel headed home and we took a huge middle of the day break, waiting for the other cast members, who had not originally planned for an extra day of filming, to get off work and out of other commitments. I finished the re-write of the “hotel” scene, now set to take place at a location near Cold Brook lake. There was still a factor missing – I still hadn’t determined whether I would need to film some very minor insert shots with Michael as Dorn later or just overdub his voice to flesh out some of the remaining exposition before it could be complete – but it was a “good enough” replacement considering the situation. At around 4:30 that afternoon, with Isaiah, Okoye, Sam, Garett and Aspen all back in the game, we resumed what I believed would be the final day of shooting. 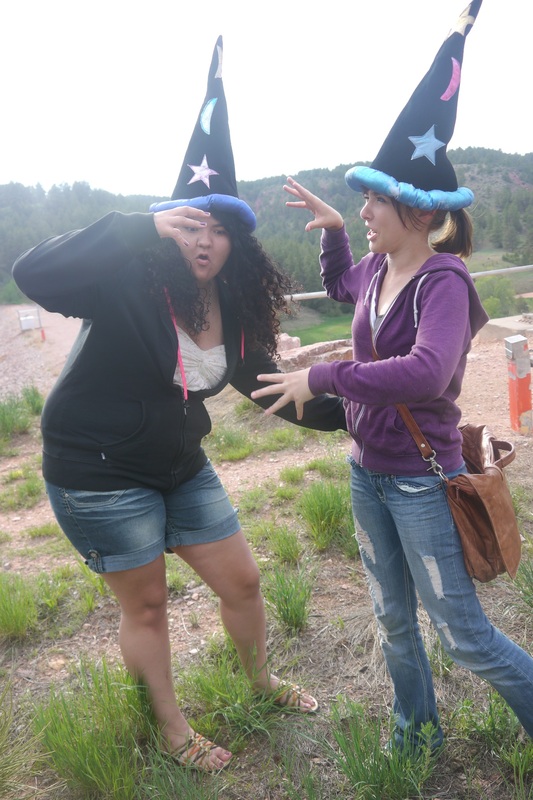 Okoye and Aspen show up their wizard hats! We took the opportunity to fill in the remainder of the “holes” from prior days’ shoots, finishing up shots we had missed from the opening and closing the film at Jamie’s house, then heading out to Cold Brook to film the new scene. An early joke made in development of the script about “thinking caps” finally made it in the film via two silly wizard hats, and we included a couple more zany bits inspired by Top Secret and the 1966 Batman TV series. Lastly, we went back to Chautauqua Park and filled in shots that would be edited in opposite Michael & Aspen. We wrapped with a shot of Sam arresting Isaiah. I sent everyone home with my gratitude and let them know I’d keep them in the loop as post-production began. Anxious and excited to see what would come of it all, I had already started drafting an early edit, and had already begun to see some scenes start to come together. But as a cohesive whole, I’d have to hunker down and start bringing it all together and see if there was anything missing. -You’re not a failure if you miss a goal. Sometimes a failure creates the opportunity for the greatest successes. -If you’ve got a great improviser, give them the flexibility to do what they do best. That’s when you get the gems. -If you can, start assembling what you can ahead of time. Even in its roughest state, it will help you find if something was missed. In the heat of the moment it can be difficult to recognize you’ve completely skipped over something important.